Your backyard dreams have come to life with this 1500 sf private rooftop terrace located in the burgeoning Financial District. This magnificent zen oasis is expansive enough for grand and stylish entertaining, dining, gardening, or just relaxing. It's your very own suburban backyard with city views! 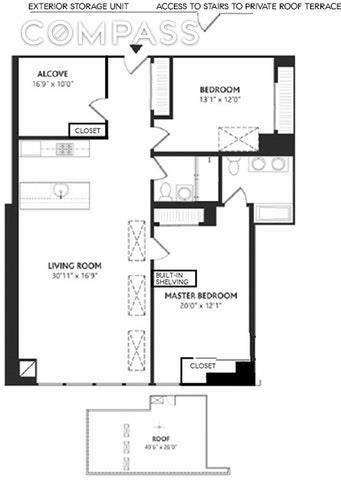 The 2 bed, 2 bath, (plus den/home office) gem, offers a modern open kitchen, spacious living room and dining area, skylights and ample closets...and a private storage room on the floor.In addition, PHA is the only home on the penthouse level, sharing the floor with the buildings amenity suite which features: lounge, indoor fireplace, state-of-the-art entertainment center, gym, billiards table, and a shared roof deck. This recreation will be an extension of your home.The Be@William is a boutique condominium located in the heart of the revitalized Financial District, close to the Fulton Street subway hub, home to practically every subway line, as well as the Path train. Also in close proximity - the historic Seaport District, the Occulus, Eataly, Whole Foods, top restaurants, and the East River waterfront and parks. FiDi is the new downtown.